Kids little brains amaze me sometimes. Jake brought his latest creation out of bristle blocks up from the basement a few minutes ago and told me it was a building from Ratatouille. I said, is it the Eiffel Tower? Of course, he doesn't know what the Eiffel Tower is so I went and got the DVD case out and showed him and he said that's what it was and seemed excited that I knew what he was building. It's so fascinating seeing how they develop into their own people. Jake is 5 and has to memorize Bible verses for Cubbies every week, and he struggles with that. And there's Rory (who is 3) in the background basically memorizing them no problem because she's always listening in. And she helps him. Freaks me out a little bit and makes me feel a little bad for Jake, not that he really cares about that stuff yet. Then yesterday I was trying to teach them about clocks and telling time from these cute Disney flashcards I picked up at the dollar store. Rory caught on right away while Jake just kind of listened and watched. But look at what his mind does...creates a famous structure out of toys! 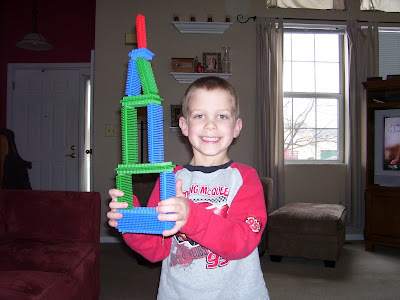 We've always had lots of building stuff around the house--bristle blocks, magna logs, lincoln logs, small, medium, and large legos, and magnetix (which, by the way, if you don't have magnetix and you have a boy 5 or older, GET SOME cuz they are so cool and fun and seem to make kids be really creative!!!). Anyway, it seems like Jake has become quite a builder in the past few months. It's become his favorite thing to do and I love seeing what he comes up with. Kids are amazing! Sometimes my couch wraps its arms around me. I am cozy, I am warm, I am taken care of by my red cushy couch and my very faded and soft blue quilt with the flannel back. I love moments like this when I feel overwhelming contentment with my simple life...just me and family at home, the kids playing upstairs, me reading whatever novel I currently have my nose buried in, knowing Mark will make his way home to hang out with us before the day ends. This is why I love winter. To be able to burrow into my home for days on end is not a bad thing. So here I sit, book in hand, my latest cookbook next to me on the coffee table in case I need a change of pace, and a fire going to take the bite off the air. The wind is howling, more snow is expected, and I say bring it on. My cozy couch (and piles of quilts) will keep me warm. 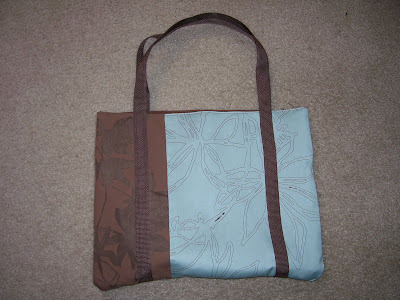 I just finished my first sewing project! This winter I've been really antsy to do something with my hands. I don't have a hobby, other than cooking, and I've wanted to find something else to help keep me busy. As many people know, my mom is a quiltaholic, so when she was here in January, we went shopping and got all the makings of a quilt. It was so fun choosing fabrics that I really love. And I just happened to have a sewing machine on hand because Mark bought me one right after I had Jake. I have gone back and forth for years on weather or not I want to try sewing, but now that I have, I realize using a machine is really addicting. I started my quilt while my mom was here and I'll be working on that for a long time. I'm really excited about it, but I also wanted to try something that I could finish quickly and see an end result. So I found a simple pattern for a tote bag online and just went for it. Even though it's sloppy I love it! Sewers of America, count me in! A couple of posts ago I mentioned I'm passionate about movies that move me. I love Cameron Crowe movies--he has such a poetic way of telling stories. His most popular film is probably Jerry McGuire, but my two favorites are Almost Famous and Elizabethtown. I absolutely can't resist Almost Famous--I am always mesmerized as I fall into that world of classic rock. The goosebumps never fail when everyone on the bus ends up singing along with "Tiny Dancer." But tonight is about Elizabethtown. I saw this movie two years ago, sitting in Abby's cozy little apartment on a frigidly cold snowy night in Minnesota. I remember freaking out after seeing it, as I have a tendancy to do when I fall in love with a movie. I just sat there, rehashing everything with Abs, and wanting to get into my car and drive across the country. I also remember being really tired that night and not catching all the details. I have an ideal movie situation. I get to indulge myself a lot during the winter, with Mark being gone for basketball so many nights. I have a routine...phone ringer turned off, limited lighting, waiting for the kids to fall asleep, a lone candle on my coffee table, beverage, snacks, and chapstick ready and waiting so I don't have to get up for anything. Tonight was a night with zero interruption so I was able to fall completely into the story. I don't think I remembered how amazing the soundtrack is...peppered with sprinklings of Elton John, Patty Griffin, Tom Petty...really wonderful stuff. I checked out Amazon and saw they had to jam the soundtrack onto 3 separate CD's! For me, this movie isn't about the romance of the characters, it's all the underlying symbolism and stuff that's hard to write about this late at night...and the highlight is by far the road trip, followed closely by me simultaneously laughing and crying during the Moon River tapdance routine. I feel like this post isn't flowing so I'll just end by saying that Elizabethtown is a movie that moves me. Our red car needed new brakes. Our water heater kicked the bucket. Our basement storage room was completely flooded from the stupid water heater. Rory flushed her Cinderella phone down the potty, making it unusable. Our van is now smoking and smells like foul burnt rubber. My kids drove me crazy. The Patriots lost the Superbowl after a perfect season. We felt alone and vulnerable. God provided a job for me that will not take me away from my kids. Some men came down from another church to help install a new water heater. The only stuff ruined in the basement flood were the yard sale boxes--hazzah for plastic bins. Mark’s dad dismantled the toilet, fished out the phone, and put it all back together. A friend here may be able to fix the van. My kids are a gift and make me laugh out loud every day. At least we had the Red Sox this year. New friends seem to be at every turn. Invaluable lessons are being learned about God’s faithfulness. What time is practice tomorrow? What are you guys fighting about?!! I don’t know what to tell ya. Are you gonna be home tonight so I can go to Barnes & Noble? What cartoon do you want to watch today? Is that me or what? Transformers and Magnetix are a mother’s best friend because little hands stay very occupied. The 2008 election will take more of a toll on me than the 2004. Homemade vinaigrettes win out every time over bottled dressings. How to truly love my neighbors. Who Am I Gonna Tag? My blog circle has already been tagged so just keep em coming.